The Ask Question Wizard Is Now In Testing! A long overdue update to our last prototype announcement, our developers are pleased to announce that they've finished the review process and responsive design updates to the Wizard and it is now in testing. What does this mean for most of you? For most people reading this, probably nothing. If you arrive to the site incognito and create a new account, you have approximately a 50/50 shot of seeing the new interface as you ask your first couple of questions, or perhaps first really great question, whichever happens to come first. We're going to be varying the criteria that sends folks 'off to see the wizard' during the experiment to determine what the optimal settings look like. How long will this be in testing? Quite some time. We can measure success and failure a number of different ways, ranging from how well questions 'land' after a few days of being asked, how fast they get answered, user interviews and even an uptick in abandoned questions might indicate healthy patterns as the wizard encourages you to think procedurally through your problem. However, it's way more structured than what we have, which can be a daunting if not overwhelming empty text box to someone that doesn't really know what's supposed to go there, so we're going to have to work to separate improvements based on the introduction of structure alone from improvements coming from individual elements of the wizard itself, and that's going to take some time. It is, as I said, a rather large change. Where should feedback go for this? Here on Meta Stack Overflow is fine. Note that, as we iterate, circumstances are likely to be ephemeral so don't put too much time into things; a screen shot with a short paragraph or some free-hand circles is really helpful and (hopefully) won't result in grief if your feedback is just quickly culled with lots of other stuff because a change obviated it. What else do you need users to do? Nothing. Hopefully, enjoy a larger bounty of questions that are more representative of what folks are capable of writing if you give them some structure and guidelines. When you see folks propose improvements, remember that the needs they describe represent a perspective we really need to learn in order to help them more, so please see usefulness in their perspectives which show us how they're actually acclimating to what we build, not just how useful you might find their suggestions. What's the criteria for the test group? ... and many other things. We'll probably start off with rep and work from there, but know it's bound to change. Someone can ask one question and hit the jackpot, get 300 rep out of it, then belly flop. While we're discussing this as one big experiment, it's probably going to be multiple experiments that run for 3 - 4 days each, some even concurrently. We'll know fairly soon if we're going to graduate the experiment and will update this post at that time, then likely continue to run more experiments just to tweak the structure and interface. I think the Earth is flat! I think getting a spaceship and going up to check it out just so we can be, you know, sure is a great idea. But if you have a question or comment about anything in this post, please leave an answer below. If it looks like your feedback is turning into something that should probably become a new question altogether (or maybe an outright bug), we'll let you know in comments. I strongly suggest switching the top entry so I need help with a homework problem comes before I have a question about my code. 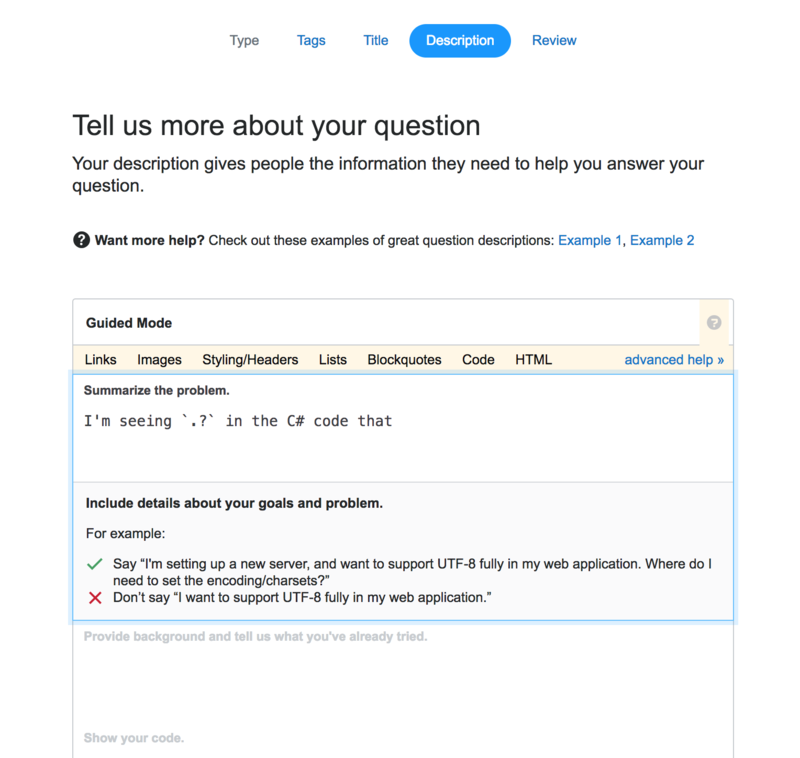 Homework seekers are one of the leading categories of problems this site sees — and unfortunately these users are often categorized as "lazy question" authors. As such, these users are more likely to stop at the first thing that fits ("…question about my code"), and fail to see the entry they actually need at all. Just to put Will's comment into a formal answer, the title should come after writing out the substance of the question. It helps them focus more on what they've written rather than what they may have originally thought their question was about. Somehow, this has gotten worse than it was the last time it was trialled. In its current state, a user who wants to ask a "how to" question without showing an attempt has to either explicitly violate the instructions in the wizard or give up and go away. That's a disaster. Probably not applicable to somebody asking a "how to" or conceptual question. This screen pretty clearly tells the user that if their question doesn't "Include a bit of source code", then they should not "Continue asking" their question. What does the "yield" keyword do? What is the "-->" operator in C++? What does if __name__ == "__main__": do? How do I delete a Git branch both locally and remotely? How do I undo the most recent commits in Git? How do I force "git pull" to overwrite local files? What is the difference between "px", "dip", "dp" and "sp"? What is a plain English explanation of "Big O" notation? How to pass "Null" (a real surname!) to a SOAP web service in ActionScript 3? In other words, our very best questions, as judged by the community, tend towards not including code. Yet these are the questions that this UI purports to ban. There's no escape hatch to opt out of "Guided Mode". It's presented as if the site demands that you provide all the details demanded here. Yet the last three sections don't apply to somebody asking a how-to or conceptual question. Describing what you've tried and showing your code is usually undesirable for a how-to question (since it turns it into two questions in one - the original how-to question and an implicit request to debug the failed attempt), and nonsensical for a conceptual question. Describing expected and actual results is likewise meaningless without exhibiting some broken code, which is something that we don't want to universally encourage users to include in their question. Requesting expected and actual results makes sense for debugging questions and for bug reports (the latter of which are off-topic), but not in most other contexts. ... which asks them to "Make sure to have your code handy". This is bad guidance. Users asking debugging questions aren't meant to just dump their broken code into a question and ask for it to be fixed; they're meant to provide an MCVE, which may ultimately be profoundly different to the (perhaps hundreds of lines of) code they started with. Credit where it's due: "Include just enough code so that others can reproduce the problem" is actually great advice, and perhaps the best single-sentence summary I've ever seen of what it means to reduce code down to an MCVE. But the good work is poisoned immediately by the advice to just copy and paste some line range from a code file in a real project. 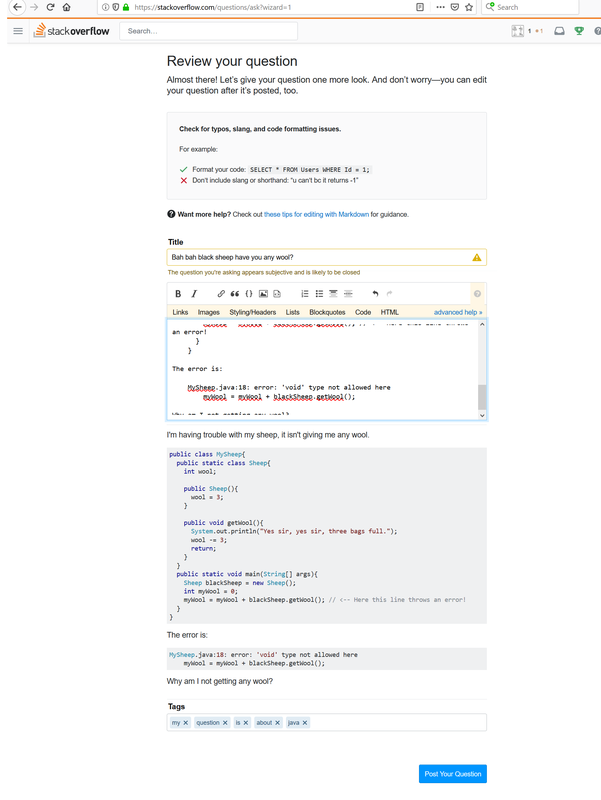 I've never crafted a question that way, and I imagine it is spectacularly rare that doing so is the best, clearest way to craft a debugging question; there will almost always be a way to tweak a real-world example to be shorter or easier to understand before posting it. So why are we recommending that users just copy and paste from their project? There is exactly one type of question that can be posted while complying with the requests of the wizard, and that's a mediocre debugging question with a block of broken code copied and pasted from the project you're working on. Such questions are... not the worst thing in the world. They're potentially on-topic. There's plenty of worse types of questions that get asked every day. But they're typically poor quality and unhelpful to future users. Will the wizard, as written, help improve the percentage of questions that are technically not closeworthy? Sure, perhaps it will - by guiding people asking crap, unanswerable debugging questions of no use to anybody else to instead ask... mediocre, answerable debugging questions that are still of no use to anybody else. It's unclear to me that that is, in itself, even a good thing. And it will come at the cost of driving away intelligent, conscientious users who might've provided useful content of lasting value to the internet, but cannot do so without disobeying the instructions that the site gives them when they try to ask. It's a filter that helps precisely the users we don't want to have around to survive on the site, while telling people we do want here that they're unwelcome. And my fear is that the downsides are not going to be measured, nor their causes improved. Tim assures us that the feature is "in testing", and Jon Chan tells us that the ultimate form it ends up in will depend upon the outcome of those tests, but nobody is hinting at what outcomes are going to be measured, or what will be considered to be success, and there are alarming warning signs that the outcome you're trying to achieve is just a reduction in the proportion of questions that are absolutely, uncontroversially worthless, without regard for the impact on high-quality questions. That's a dangerous thing to optimise for. And the fact that we're still having to fight against the wizard wrongly telling users that we are a helpdesk that only accepts debugging questions - which Tiny Giant has been crusading against for over a year - is starting to make me lose hope for any meaningful change happening before this feature gets finalised. I'm writing some code, and this piece of software that I'm using is broken. Let me ask a question on Stack Overflow! Alright, the first page is asking me what type of question I have. Well, it's a problem with the software I'm using to do my coding, so I guess it's "a software or hardware issue." Now, my question is about programming-related software, so it should go on Stack Overflow. However, I'm being told to put it on Super User. 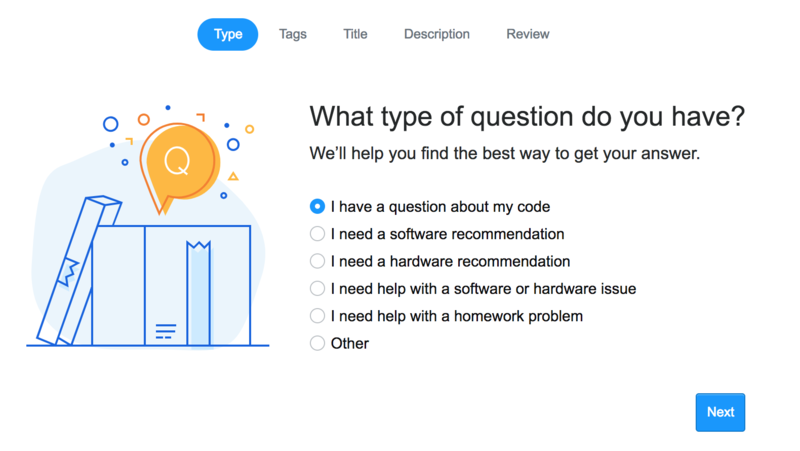 I understand the value in keeping the sentence "I need help with a software or hardware issue" short, so perhaps the Super User redirect page should clarify that Stack Overflow is still where programming-related software questions should go? I'm pretty sure softwarerecs isn't for hardware recommendations. I really like the guidelines given when you select regex. What other tags have that? Are there plans to add guidelines for other tags? Could you publish a (temporary?) route where we can go if we want to try out this thing without having to create anonymous accounts and gamble with probabilities? Make sure that the wizard doesn't only cater to debugging questions. As I understand, algorithm and a few other language-agnostic tags are still on-topic on Stack Overflow. These don't necessarily have a "language, technology and/or framework" associated with them. On-topic questions should have a straightforward path through the wizard from start to end. I'm all for it being out in the wild for testing. The team has managed to implement a whole lot of the features from the original announcement's answers. Great way to start weeding out the questions that belong on other sites. 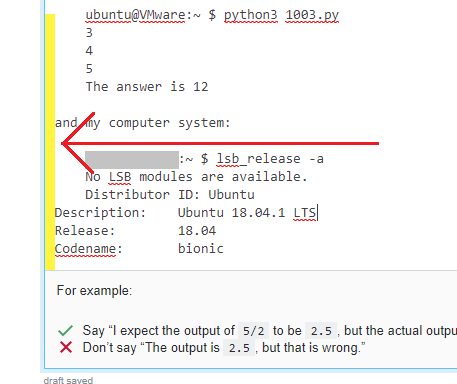 It's clear, and it isn't overly biased towards debugging questions. The example of how to think about what your question is about is good. 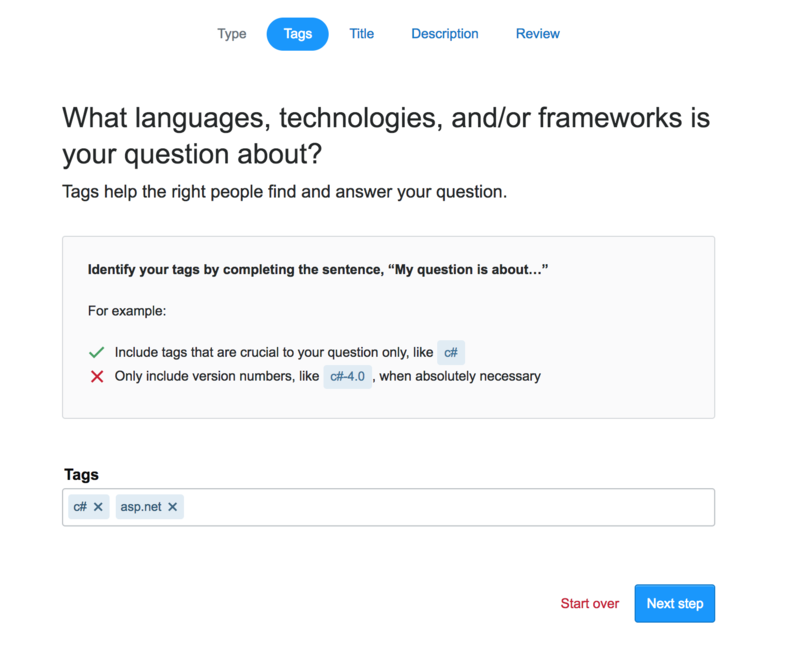 Hopefully won't get people typing the full "My question is about java" into the tags box though; perhaps if someone misunderstands and types the phrase as written, it can be stripped off the front of their potential tags? Thank you for giving an example that is more of a How To and less of a debugging question. In the Background section, I think it would help to include the word research, to help drive home the point that users are expected to actually do research, not just explain where they got stuck and stopped trying. "Provide background and share the research you've done to answer your question already, including what you have already tried." I say this because if someone wants to dump their homework question, "Sally wants to get the names of all people who meet x conditions between 3 tables," a person can say that's the background and share a half hearted attempt without ever researching their issue, and seeing as how many current questions are poor due to lack of research, I think we should err on the side of bludgeoning people over the head with the Do More Research mantra. In the Show Your Code section, does it come up with a guide box that explains what an MCVE is? If not, I highly recommend that gets explained at least briefly, with a link to the full MCVE page. Overall it's looking really good. I hope it has some of the effect we're looking for. One last thing: how do we plan on measuring the efficacy of the wizard? Is there somewhere empirical, like SEDE or the API, that we laypeople can look at to see which questions have been created using the new wizard, or is that considered to be internal information? Mostly because I'm curious to see what kinds of questions the wizard elicits. One thing that I think would be really good is to allow users to also opt-in to using the wizard when they don't match the criteria (perhaps a "Use the wizard" button/link at the top when creating a new question). Looking forward to the results and evolution of this! The artist seems to be heavily inspired by M.C. Escher and/or Cubism? The upside-down bookmark seems a tad strange. Kevin B points out below that I am indeed perceiving this incorrectly. It's a box, not books. What happens when a user clicks "I need a hardware recommendation"? Hardware Recs is a tiny site with strict quality and on-topic guidelines. SO is a huge site. If everyone who picks that option gets sent straight to /questions/ask on HR (or even to /help/on-topic - let's be honest, only a small number of users will actually read that), it will completely overwhelm moderation capacity on HR. The effect won't be quite so bad with this in beta, of course, but if/when it's deployed fully, that's something I don't want to happen. I have an existing request that I'd like to take this opportunity to highlight. In my opinion, one of the best things a question can include when it is similar, but not identical, to an existing questions is a citation of that question (so that reviewers can see that the asker is already aware of the existing question) and an explanation of what is different in the new question.... So I think the "Ask a Question" wizard should probably encourage citing existing answers, rather than simply "reviewing" them to see whether there's an exact duplicate that removes the necessity of asking a new question in the first place. 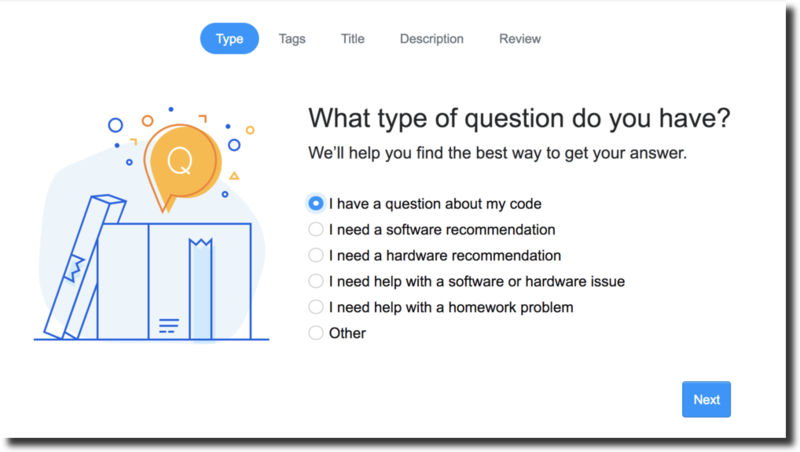 Add this text, or something similar: "If one of these questions is similar to yours but does not address your specific use case, please link to it in your question and explain why your question is different." Add checkboxes for selecting similar questions, and auto-populate the question field with links to these questions. This project is definitely making progress. The wizard is a terrific idea, and has strong potential for helping users. I really like the direction this is going. I really like that the tags can now be paired with the title to look for duplicates, I am legitimately excited to see that play out. That said, I do have some feedback on the radio button list. As far as the first bullet point, I think that perhaps the wording of "my code" could be changed to "some code" because it isn't always the OP's code which is being used in the question. I think that the real estate in these bullet points is very valuable, and would suggest that it carefully used. A concurrent A/B test for different bullet points would be nice, however, that could also complicate the data so I understand not really wanting to do that. Two bullet points stand out to me as not being worth the real estate value on the list: software and hardware recommendations. Recommendation questions are not exactly a pressing issue. In my opinion, this is a solved problem. 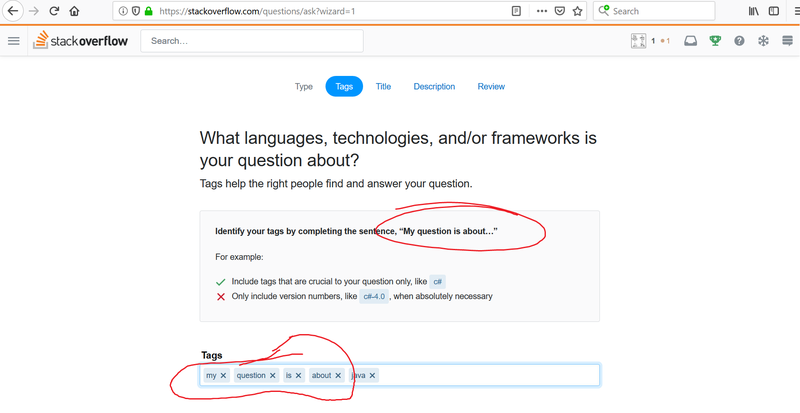 I don't think we will find much disagreement in the community about what to do with recommendation questions at Stack Overflow, and I don't have the numbers but I would assume they get closed pretty easily compared to other categories. I suggest that we examine alternatives to these two bullet points which are more inline with the topicality of Stack Overflow. There is quite a lot of stick in this list, and it may make some sense to include a little more carrot. I have a question about how to solve a problem with code. I have a question about a coding concept. These could then be paired with guidance from the how-to-ask page with regards to ensuring they are not too broad, are still topical to Stack Overflow and not another exchange, and are not too help vampire-y. This would address, in my opinion, the overall topicality represented by Stack Overflow. That said, I also understand that the main reason this wizard is being put in place is to prevent low quality questions, and perhaps that just means we need the extra serving of stick and that carrot is just not needed here. I originally posted this over on Stack Exchange and was suggested I post this here. 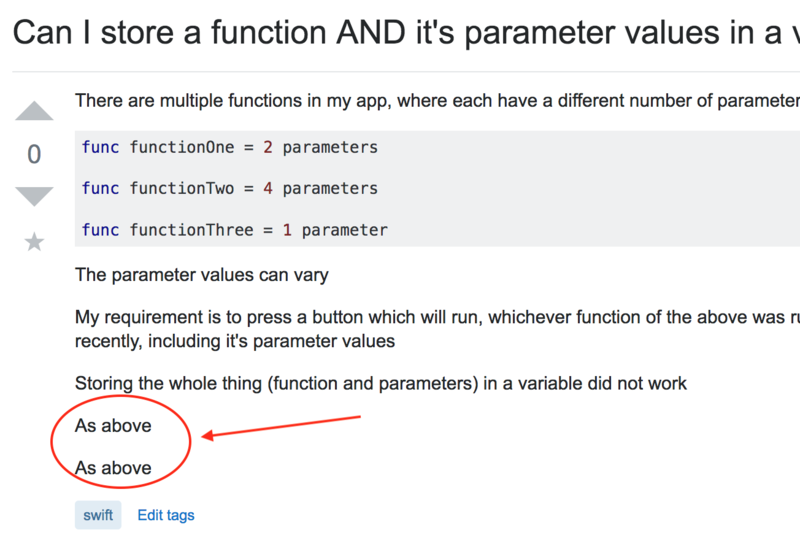 I'm looking to ask a question on Stack Overflow, and am getting a new guided mode format for asking the question. When I'm composing the body of the question, I don't see the formatting toolbar. This means I can't upload an image. I would upload an image of what I see in Guided Mode, but well...I can't upload an image. I understand I can use image links but image hosting websites are blocked from my work place. Is anyone else able to see the formatting toolbar in Stack Exchange's new Guided mode, and can you upload images? If the answer to 1 is no, ie it's not just me, is there any way to turn off Guided Mode, or otherwise be able to upload images like I was able to before Guided Mode? The UI is suuuuuuper buggy when entering the question's body of code and text into the editor. Entering stuff and then clicking away from the editor on the edges of the page makes the page scroll way up to the top-ish area of the page. Also, part of the text of the post during the editing phase shows up below the footer of the page and it looks really wonky. One of them is not like the others. Can you guess which one? It's the homework one. We don't have a homework.stackexchange.com and for good reason. This should not be an option on a first pass filter designed to check if the question is anywhere near on topic. If the homework option is still needed to trigger additional guidance, it should be separate from identifying whether the question is on topic. In its current position, it effectively bypasses the on-topic filter altogether. Change "I have a question about my code" to "I have a question related to code." The current version sounds too much like the code already exists, which may not be entirely the case, and implies that the code necessarily belongs to the author. What is a "software or hardware" issue? Is my code throwing an exception a software issue? I'm guessing this steers them toward SuperUser. Make this a little more specific. Maybe, "I'm having an issue with software I didn't write" and a separate options for hardware? I'm open to suggestions here. If you pick "Other" you get a little blurb based on the on-topic page. In particular it suggests you might need "bit of source code". If you look at terrible questions, they are often vague requests based on a desire with no evidence they've tried anything. So yes I am hoping to have fewer of those questions.To encourage them from a new user seems like a good way to get more bad questions. Valuable questions are hard to write. But most people seem more concerned with utterly useless questions that this feature is designed to limit. If you look at terrible questions, they are often vague requests based on a desire with no evidence they've tried anything. So we are being told that because there are "terrible questions" that are "vague requests based on a desire with no evidence they've tried anything". Which means that because some questions that Jon thinks are "terrible" are "vague requests" and they don't include an irrelevant attempt, all questions should be debugging questions, and any questions that don't include an irrelevant attempt should be discouraged. So yes I am hoping to have fewer of those questions.To encourage them from a new user seems like a good way to get more bad questions. ... But most people seem more concerned with utterly useless questions that this feature is designed to limit. So this feature is "designed to limit" how-to style questions—arguably the most useful category of question asked—in favor of debugging style questions—arguably the most useless category of question asked. This explains why my previous feedback on this matter has been completely ignored, and why the current implementation of the wizard still implies that how-to questions are off-topic; as well, it shows that the community's feedback doesn't mean very much to those implementing this project unless your opinion is inline with theirs. Get the above with the number of entries previous to those on the current page. This is clearly in response to the actual part of "Describe expected and actual results. ", but that's not clear from only seeing the question and I had to check the wizard to see what the prompt actually was. Looking through the code and removing/changing various functions to see if they make a difference. Request: Can we either leave the prompts in or prompt users to lead into these points so that when the question is posted the points aren't missing context? On a side note, from my single piece of exposure to this, it seems to work all right as the question was above average for new posters (from what I've seen). I need help debugging my code. Stack Overflow can help you with debugging problems, but make sure you ask with a [mcve] that is has the minimal code needed to reproduce this problem. Don’t paste in all of your code! Say "I'm setting up a new server, and want to support UTF-8 fully in my web application. Where do I need to set the encoding/charsets?" I don't think this is an example of a good question. I often encourage people to avoid general "how do I do this?" type questions, and to ask specific "I tried X, expected Y, but got Z instead" type questions instead. Could we use a better question as the example of a good question? Say "I'm setting up a new server, and here is the config I'm currently using. I thought line ABC would enable UTF-8 support, but when I enter XYZ, I get this error. What am I misunderstanding?" Obviously there is plenty of room for wordsmithing, but hopefully my point is clear. That's a really great idea - This definitely gives appreciated guidance to new users and raises the bar in terms of quality! I also like the recommendation part already filtering out unsuitable questions. On that matter - would it be useful to add a "I'd like my code to be reviewed"-trap as well since those sort of questions rather belong to Code Review as mentioned here and many other places? "Where should feedback go for this? Here on Meta Stack Overflow is fine." Does that mean as an answer to this "question", or as an entirely new question? If the former, please be precise and specify that; if the latter, won't we just end up with dozens of "hey this thing is broken on the wizard, fix pls" questions on meta that will drown out everything else? if they have any follow ups, to accept the best answer to their current problem, and open a new one? A good number of users glaze over the tour or just skip it entirely. Having these points repeated here as a footnote of sorts where it cannot be ignored would really make a difference, IMO. If you could fit in the link to the /someone-answers link in here as well, that could hopefully reduce the number of users who ghost/abandon their question as soon as they've received an answer (simply because they are not aware that there are things they could/should do when someone answers). The usability of the wizard is extremely poor at the moment. The screen kept jumping randomly to various parts of the form, making it very hard to comprehend the underlying workflow. It took me 10 mins to enter a question which would have taken 1 min using the old UI. A quick Ctrl+F, didn't find anything mentioned about this, but in the tags page, I think it would be useful to add another red X about tagging IDEs when problems about the code itself are less often related to the tools people are using. For example, android and android-studio are often tagged together, when in fact, the problems might actually be with android-gradle, but people probably just don't know, which is fine. I think it makes less signal-to-noise for those that would be following true issues related to the IDE (which probably could even be intellij-idea issues instead here) rather than just tagging essentially what acts as the text-editor of choice for questions truly about the code. Tangentially related, there are tags that might make sense together, like hadoop and bigdata. However, I find one a specific question about Hadoop (code, framework, tool, etc). But, then if someone has "a large" 1GB file; in modern-computing that is really not bigdata, yet someone might seem perplexed how to process this "such large file", so they add bigdata... Is it somehow possible to "flag" buzzword-y tags? 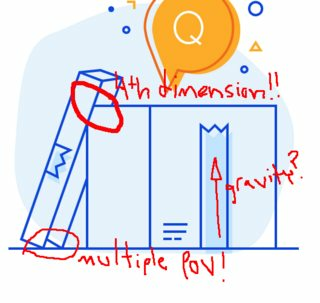 I've been a StackExchange member for 6 years, asked 9 questions and answered 11 with positive rep all around, but for some reason I have just had my hand held on my first Stack Overflow question. I'm by no means a veteran, but I like to think by now I'm at least semi-capable of asking a question on Stack Overflow without being patronisingly forced to color-by-numbers. 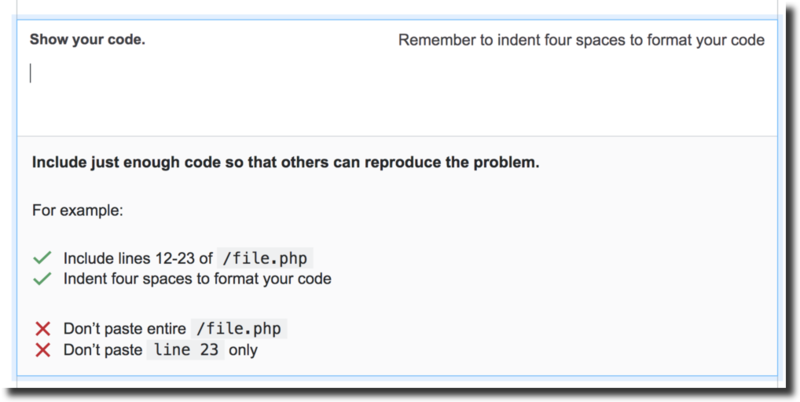 In the "show your code" section, I am prompted to indent my code by 4 spaces. OK fair game, so I went on and tried to click at the beginning of each line before hitting Space 4 times. Whenever I clicked into the yellow area (left margin), the whole input box flashes yellow and didn't work as expected (move cursor to beginning of line). I also don't see any intuitive prompt or tool to help me indent my code. When I went back and want to take a few more screenshots, I found I couldn't summon the wizard again, even if I go to /questions/ask/wizard directly. Shouldn't this be allowed to opt-in? 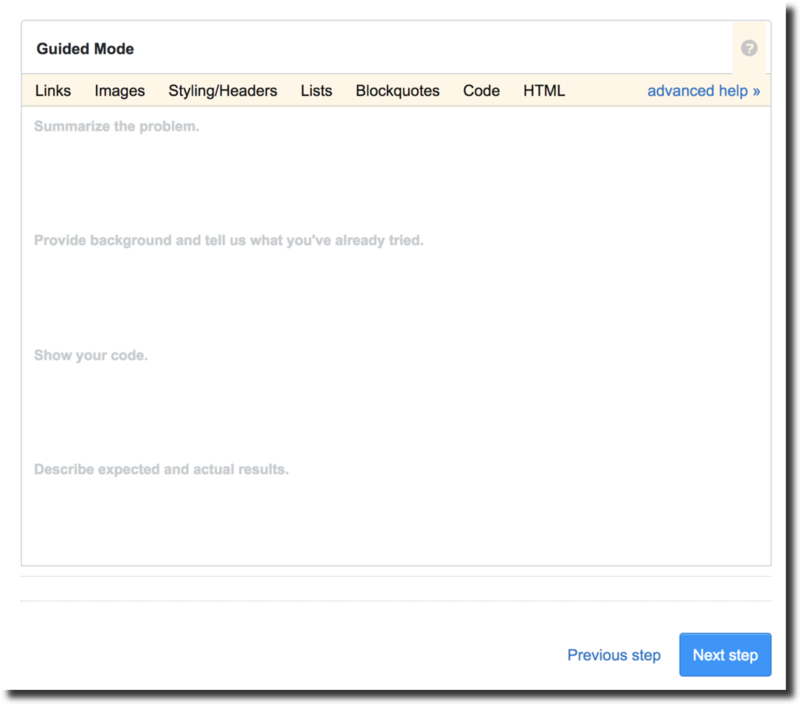 Removing "common new user mistake checks"
The experience changed depending on the user's tag likings and privileges. Just have the wizard be part of the site for everyone, not just new users. Could you prompt people to create a working snippet if the language they are asking about is supported by the snippet functionality? I've never met a good wizard in my magical life. Actually this is inaccurate. I've never seen a wizard that solves the redirection problem in a way that wants me to interact with it. Wizards are just UI versions of a "Choose 1 for account information, choose 2 for security team". I think it would be much better to post process the questions and maybe automatically move them to another sites. Not the answer you're looking for? Browse other questions tagged discussion asking-questions a-b-testing ask-question-wizard . 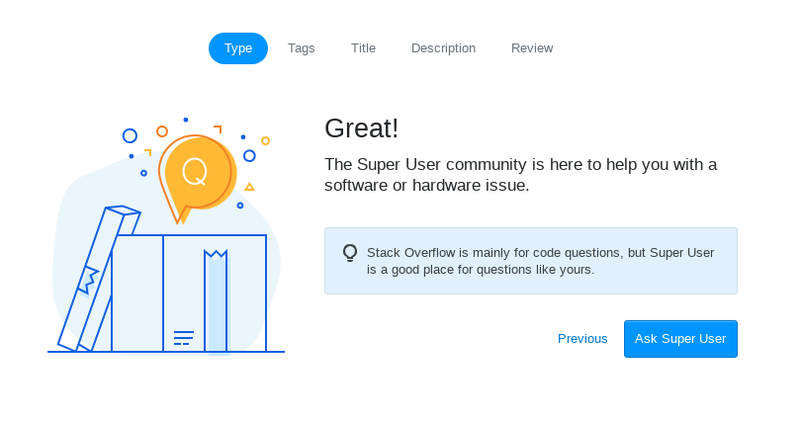 When is Stack Overflow going to stop demonizing the quality-concerned users who have made the site a success? Divisions, disappointment and pillory: how can we make meta a more enjoyable, productive space for everyone? 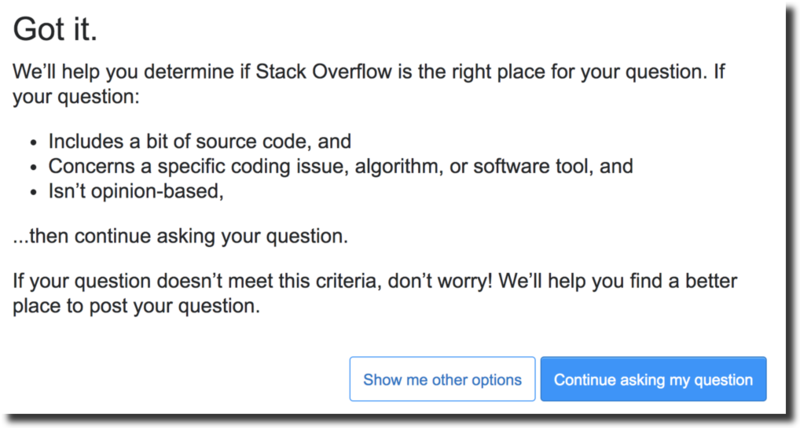 Is Stack Overflow becoming an error-detection site?